Elegant and graceful, Siberian Iris are a lovely addition to naturalized areas and cutting gardens. Growing 24-36 in. 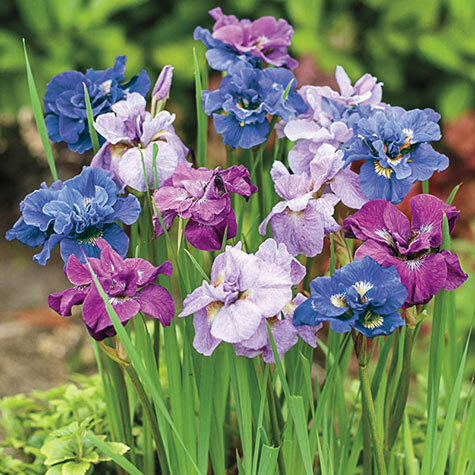 tall, Siberian Iris Mix blooms in late spring or early summer in a blend of blue, purple, white or yellow flowers, our choice. Its grasslike foliage remains attractive after the flowers bloom. Because they bloom later than German or bearded iris, Siberian iris are a great way to extend the iris season. 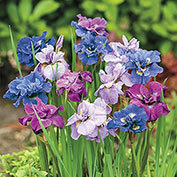 For best results, plant these easy-to-grow irises in full sun to partial shade. No. 1 bareroot. Zones 3-8. Depth: Needs even moisture. Plant rhizome with the roots spread out and facing down and the top of the rhizome slightly exposed above the soil. Foliage: Slightly arching, narrow linear foliage 1/2 to 3-4" wide, ribbed and thickened along midrib. 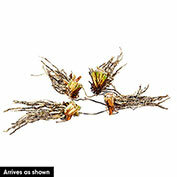 Pruning: After flowering remove spent flowers. Remove old foliage before new spring growth emerges. Comments: After the German iris has gone, but before the ensata iris bloom, that's when this Siberian mix takes the stage with its blend of blue, purple, white and yellow flowers. Graceful and bright, this colorful assortment delivers a dash of beauty and style to naturalized areas and cutting gardens. Easy to grow, it neatly fills the space between early-spring and late-summer bloomers.